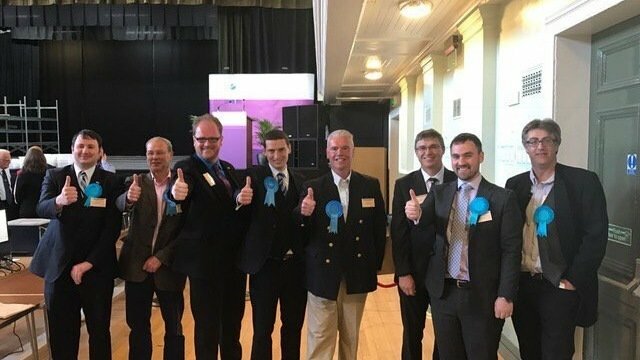 Last week two Tory councillors were elected to Stirling Council and have since been outed as one of the most notorious twitter trolls (@mulder1981) and the other a total racist. Alistair Majury stood down temporarily on Tuesday and was talked out of it by Tory HQ who seem to think that it’s ok to retain these vile people both in their party and as councillor representatives of the community. Majury was a Boys Brigade leader and has been asked to stand down. He was in a position of power over kids and particularly two vulnerable adults with Aspergers. One of the young adults asked him at the weekend if he should call police on the silent protest in Dunblane and Majury said yes. The others then packed up and left the young person to deal with the police when they arrived (and of course realised there was nothing to investigate.). So not only wasting police time but also not even being man enough to hang around to speak to them. Further the two people who outed these men had their twitter accounts frozen last night and were only permitted to ‘un-feeeze’ them by agreeing to delete the tweets. So it’s ok for these obnoxious tweets to be there for the last few years but not for someone to hold them to account about them. Guessing some Tory sympathisers trying to cover this all up and complaining to twitter. A petition was started this morning (not by me) calling for their resignation and if you feel able to circulate amongst your networks that would be greatly appreciated. By way of a declaration of interest, I was a candidate for the SNP against Majury. He won in the first round and polled top. Even if he resigns there is every chance a new Tory would win the by-election given the very high Tory turnout in the ward, although I would stand and would fight them all the way. However, I am not promoting this for self-advancement, I’m promoting it because neither of these people should be making decisions that will affect local people’s lives and should be held to account for their actions. Here is the petition link HERE. Please sign and share…. That mulder1981 account seems to no longer to exist. The Tory GE17 candidate for Edinburgh South (a key Tory target) Stephanie Smith has also frozen her account @SJHMurray. While it was active there were a few ‘off’ tweets on it. The Tories are covering their tracks. I really struggled to understand this article. In fact, the piece needs serious editing. Making public allegations against elected officials is a serious matter and requires a better standard of writing and treatment of evidence than is seen here. I’m not disputing the allegations, just asking for more clarity. This is a guest-post by Rosemary who is not a writer but a prospective candidate. None of the facts are debated. Is there something that is unclear to you Frank? I think I come in on Frank’s side. The article would gain in authority if it were edited a bit, for instance for punctuation. Also, the circumstances of the police visit and the “silent protest” are unclear to me. A little information would help. Otherwise, kudos to Rosemary for speaking up and showing the kind of civil courage that is sorely need in this day and age. The kind of behaviour by elected representatives that she is calling out is something that, if left unchallenged, will eventually destroy the foundations of our democratic society. The big problem with the article Editor (and it’s glaringly obvious!) is that it provides no background information and assumes (wrongly) that most readers know the specifics of what the author is talking about. The author or the editor, should take more time to provide readers with an understanding of context. It’s also a good idea when publishing articles which accuse people of being ‘total racists’ to provide evidence to support claims. This is just the ABC’s of good journalism. As I said before I’m not saying the allegations are not ‘true’ just asking for more clarity and evidence. Interestingly on the Catholic Observer discussing Majury, Prof Adam Tomkins has a bizarre piece condemning Sectarian singing from Rangers fans, yet he himself is a regular user of terms like WATP on twitter. He ends the article by saying that the Old Firm shouldn’t be political but anyone who sees his twitter feed can see that he does exactly that. calling in the referendum for Rangers fans to vote no. Aided and abetted by his Holyrood colleague Murdo Fraser tellin Rangers fans voting no would lose the Queen, the Pound etc. It is clear to me that the current crop of Tory newbies have been emboldened by the type of language used by elected representatives and that is part of the reason we are seeing this type of behaviour that we thought we had gone some way to removing from Scotland. The Tories actions appear to be a deliberate attempt to give legitimacy to these extreme organisations. They appear to be operating a short and long term strategy. The short one is to consolidate the unionist vote. The longer one is to disrupt social stability. The OO was out and about marching with their flute bands today.The surrounding streets were empty of supporters. Such a difference historically, from the streets being crowded with people waving union jacks. The good folk of Scotland do not want a return to the violence of the thoughts and actions of these organisations. Empty streets tell all. Perhaps not quite. The unionist meaning of the “silent majority” is quite subtle, and there is good reason for their silence. Aside from the ‘Scottish’ landed gentry, other vested interests, the OO, and varied eejits voting Tory, there is, as Sir Tom Devine alluded to yesterday in The Herald, the up to one million ‘No’ voters from rest-UK that pull No over the line. The census tells us that the No vote is being heartily replenished, year on year, just not by Scots. The Conservatives know exactly what they are doing. They are mining sectarian resentment in the cause of Unionism. Over recent years the sectarianism of a Protestant country for a Protestant people and send the Irish Catholics home as the Moderator Of the Church of Scotland in 1923 called for may be gone. But such sentiment is not dead, and it could well come back in a similar but different form. Read Brigadier General Sir Frank Kitson’s work on how to retain colonies and you get the drift. Where democratic will looks likely to succeed the British state has strategies to counter. The Tories will seek to deploy these strategies and the knuckle dragging bigots that they groom, like the loyalist gangs that they funded in Ireland, are all part of their Retain strategy. General Sir George Knox when asked how best they could deal with a united Catholic/Protestant movement for a united Ireland re-plied leave it to me I will play the Orange card,the rest is as they say history,they don,t/can,t/won,t see that they are being played as in “Maggies secret talks with the IRA behind their backs,just look at the mess “The Rangers” are in,the good supporters are being cowed by the bigot gangs who are being shafted themselves by those with a lot more savvy than them. That picture of 8 white over-50-ish males. Diverse & inclusive message or what? I’ve always wondered if you were Northern Ireland Protestant with progressive views – who the hell do you vote for? Here in Scotland we’ve always had the ‘pomegranates’ – orange on the outside and red inside. It seems that this is the vote Ruth and her Tories are after – University fees next? It’s blindingly obvious that in smoke filled rooms it has been decided to introduce ‘ulsterisation’ into Scottish politics. David Torrance and others led the black flag notification of what lay ahead several months back. And Ruth Davidson’s ‘No Surrender’ all out loyalty to the Crown and the UK State narrative has been devised to allow vermin such as these two neantherdals to gain election under cover of the Tory party. Davidson’s tack has altered significantly post Brexit to one of ‘loyalty’ to the bogus ‘Global Britain’ ideal which by definition excludes ‘separatists and extremists’..resonating with many Scots of a small ‘c’ conservative outlook. Our scabrous media, funded by the UK government either directly or indirectly and heavily backed by the BBC has done everything to launch concerted targeted attacks on the SNP and personal attacks on Nicola Sturgeon. She has been villified steadily in order to diminish her political impact by traducing her image as a ‘remoaner’ and marginal figure in the ‘real’ battle between ‘strong and stable’ TM and the equally media reviled Jeremy Corbin. Meanwhile, she and the tory hierarchy back in Westminster, her puppet masters, are happy to see the scum which has been mouldering and smouldering down in the dregs of Scottish society being stirred up into righteous wrath towards the perceived ‘disloyal’ , jacobite, republican snp. Believe me, I have read these absurd and obsolete terms used in loyalist websites. The tories , led by May are prepared to allow civil disorder in Scotland in order to, if necessary, and ultimately impose direct rule on this country and abolish the Scottish parliament and rewrite the Act of Union to incorporate Scotland into a greater England. Remember the events of the 19th of September 2014, when the loyalist thugs came out in their hundreds into George Square? The burning of Saltire flags, the brutalising of young idealistic YES supporters?. Remember the lies the media told? Andrew Neil claimed the footage of the mob was false and from ‘elsewhere’. The BBC Scotland reporter Cameron Buttle, who reported the initial assault as ‘a coordinated attack from three sides of the Square by loyalists wearing Rangetrs scarfs, tops etc’ but who later altered his report to simple Yes v No supporters? No organisations were implicated or prosecuted by Police Scotland. Although a handful of arrests were made, including two young ‘YES’ supporting sisters who were photographed being assaulted by thugs, no leaders of what was clearly a coordinated attack were ever charged with conspiracy to riot. Contrast and compare with the last Cup Final involving Hibs fans celebrating their 100 year plus victory at Hampden which had a natural pitch invasion involving jubilant supporters. It was spoiled by Rangers fans also coming on to the pitch and a small and short lived skirmish occurred. The occasion marred by other pointless acts of vandalism merited some arrests, but subsequently has led to 150 plus arrests of fans, achieved by a relentless investigation into hours of video footage. The numbers are way in excess of the minimal violence or damage caused. The point is that Ruth Davidson and her despicable Westminster inspired ‘orange card’ strategy is a dangerous and despicable intervention into what has been Scotland’s journey to self government. We need to be able to rely on our forces of law and order and legal systems to be vigilant and fit for purpose to quell and defuse any outbreaks by these sectarian cavemen and women and make it clear to Westminster and the world that we will not be railroaded by a historical narrative created and manipulated by our hitherto colonial masters trying to further their own loathsome objectives.